This article is featured on P24 of the current issue of Ecozine, along with other exclusives from Pharrell Williams, Captain Paul Watson of Sea Shepherd, and more! Pick up your copy today at Bookazine, Dymocks, or Page One (and many other locations in Hong Kong)! 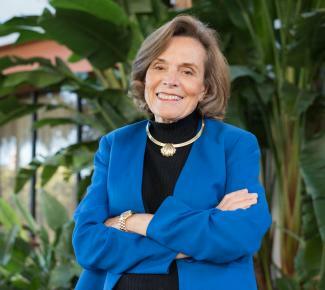 Ocean advocate Dr Sylvia Earle has been at the forefront of deep ocean exploration for more than four decades and is not planning to stop any time soon. Having led over 50 undersea expeditions and spent over 6,000 hours underwater as both a highly respected field scientist and a National Geographic Society Explorer-in-Residence, her life’s mission is to save our oceans and the creatures that live in them. Read on, and be inspired. Your work for the oceans has been significant. Was there a particular moment that ignited your passion for ocean conservation? My first encounter with the ocean was on the Jersey Shore when I was three years old and I got knocked over by a wave. The ocean certainly knew how to get my attention! It wasn’t frightening. It was more exhilarating than anything else. Life in the ocean had captured my imagination, and it has held it ever since. You’ve spent so many hours in the water during your impressive career. Have you witnessed any notable changes over the years? I have personally witnessed a time of unprecedented discovery – and unprecedented loss. Half a century ago, it seemed the ocean was too vast, too resilient to be affected by our actions. Now we know: Coral reefs, kelp forests, numerous kinds of fish and other ocean wildlife have declined sharply and even disappeared, owing to pressures we have applied. Dead zones have appeared. Oxygen-producing plankton is declining. The ocean is in trouble - and that means we are in trouble, too. Sadly, some losses are irrecoverable. I remember meeting one of Florida's most charismatic animals, the Caribbean monk seal, a playful St. Bernard-sized creature that once lolled on beaches throughout the region. The last one was sighted in 1952. The species is now officially listed as extinct. Tell us about Mission Blue. My dream is for everyone to use all means at their disposal to spark a movement to create a global network of marine protected areas – “Hope Spots” – large enough to save and restore the ocean, the blue heart of the planet. That’s why I founded Mission Blue. Currently, less than three percent of the ocean is protected in any way, and 99% is open to commercial fishing. By designating Hope Spots around the world, [our goal is to] safeguard at least 20 per cent of the ocean by 2020. What can Ecozine’s readers do to support your mission? Look in the mirror, consider your talents, and think about how you might use them to make a difference. Some have artistic skills; others are good with numbers or have a way with words. Everyone has power to make a difference as an individual. The key is in knowing that what you do matters, including doing nothing! We need to convey a sense of urgency because the world is changing quickly. We have options that we are going to lose within ten years unless we take action now. What is your all-time favourite dive spot, or diving experience you've had? Oh, there are so many. One dive that comes to mind is at a place called Marion Reef in the Coral Sea, diving in 21 metres of water, and these grey reef sharks circled us. I couldn’t count them, there were so many – at least 100. They were forming a great wheel around us but were quietly curious, not aggressive. It was a little hair-raising – had they chosen to gang up on us, they could have easily consumed us. But they were just looking. What’s a typical day in the life of an ocean conservation icon like? There is no such thing! Part of the joy of doing what I do is that nothing is "routine," not even sleeping. I spend about 300 days out of the year traveling for expeditions and scientific conferences. I give lots of lectures, sometimes from dawn until dusk. It’s one of my favorite things to do besides diving, which I also do frequently. What’s your top conservation tip? Our giant appetites have consumed 90 per cent of our big fish in a just few decades. How long before those fish are all gone, if we keep eating them this way? Everyone can make a difference just by changing what they consume. Less demand will mean less support for huge commercial fisheries. It isn’t too late to shift from the swift, sharp decline of ocean systems in recent decades to an era of steady recovery. It’s time to take care of the ocean as if life depends on it, because it does.